It’s been a warm week here, almost spring-like. 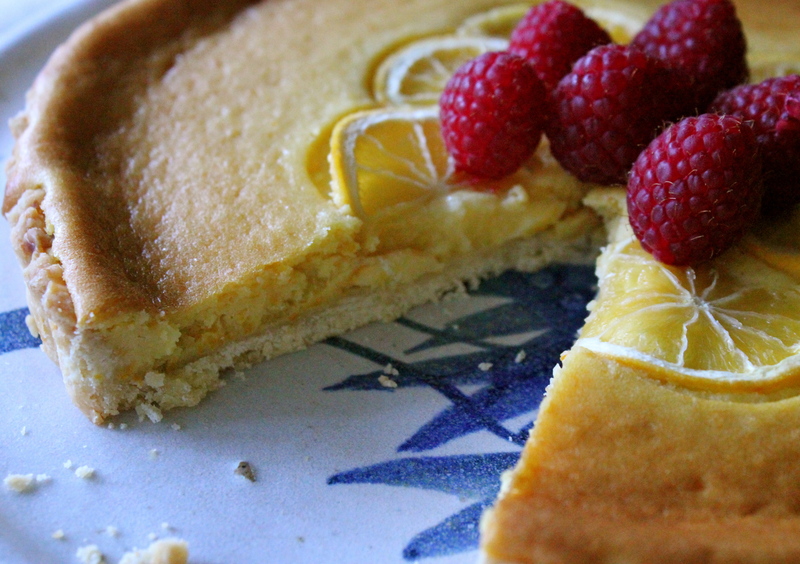 Whenever I think of spring I always want easy, light, fruit-based desserts. I imagine myself on a porch somewhere in the south of France (a place I’ve never been, but bear with me), hanging crisp white linen on a line and reaching up to pluck a perfect little lemon from my lemon tree. I examine it, smile a secret smile to myself, and then drop it gently into my apron pocket, as a warm breeze floats through the backyard carrying the scent of lavender. Then Johnny Depp sneaks up behind me, enveloping me in his manly embrace. Then I, um, bake a tart. WIth Johnny. Let’s move on. I wandered around the market the other day looking for ingredients to satisfy my craving for French, um, food, and found Meyer lemons. I had never cooked with these before, but of course had heard of them, as every yuppie cooking store and bakery has something with Meyer lemon curd. Being a foodie nerd, I frequent these places, but am always too scared to try baking anything I see. No longer. It’s no surprise these little guys are so popular, because holy cow are they delicious. A cross between a mandarin orange and a lemon, they are slightly sweeter than a regular lemon and have a beautiful, free-range egg-yolk colored rind. I used Martha’s recipe for both the crust and the filling, but honestly, it’s a LOT of butter. You can follow hers, or you can use this one, which I adapted from The Greens Cookbook by Deborah Madison. Both are utterly versatile and utterly delicious. 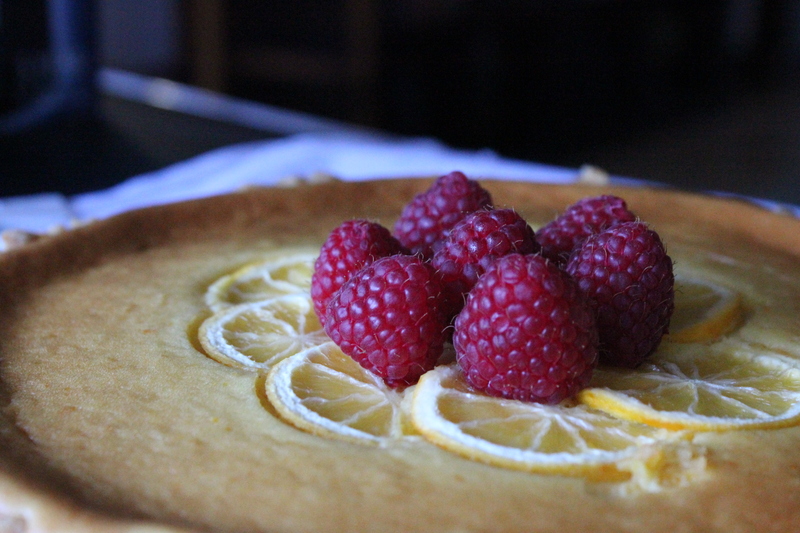 For garnish, you can see I used raspberries, but serve it plain if you like; it’s mostly the color that I love. I also sliced one of my zested lemons extremely thin and arranged them in a little circle on top (well, it WAS a Martha Stewart recipe), but this is also totally optional. If you decide to do this, make sure you slice them super super thin to get them to sweeten up in the oven, otherwise they will be beautiful and also sour, chewy, and the part of the pie that ends up pushed to the side of your plate. Note: The key to perfectly crisp crust is keeping the butter cold; don’t stress out about it, however, because it will be delicious either way. If you have more than one tart pan, make double the crust recipe and freeze one (wrap it well in plastic wrap, then slide it into a freezer ziploc bag). Then you can just bake it off and fill it whenever you get a hankering! To speed along the cooling process between steps 4 and 5, I put my baked tart shell in the freezer after it had cooled a bit and it was ready to fill when my filling was done. First, make the crust. Combine the flour, salt, sugar, and lemon zest in a bowl. Cut the butter in small pieces, add it to the dry ingredients, and rub the mixture between your fingers to make a coarse meal. Add the vanilla and about a tablespoon of ice water and mix lightly with your fingers until the dough comes together. You might need to add a bit more water. Gather the dough into a ball, press it into a round disk, and wrap well in plastic wrap. Place it in the refrigerator and let it rest for ½ an hour. Take the dough out of the fridge and press it into your tart pan. It is best to do this with your fingers and the heel of your hand, since the dough will soften quickly. Take care to get the dough all the way up the sides, rising about ¼ inch above the rim. Cover the shell lightly with foil and freeze for 30 more minutes. While the dough is freezing, preheat your oven to 375 degrees F.
Bake the shell for about 20 minutes. After 5 minutes of baking, check on it and prick any large bubbles that may have formed with a sharp knife. You may need a little more or a little less baking time depending on your oven. Take it out when it is light golden brown. Let it cool completely on a rack. 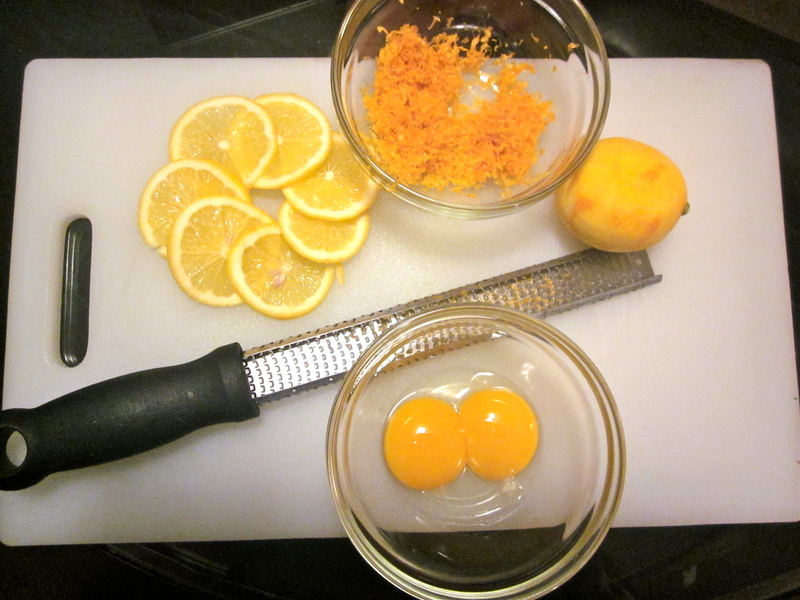 Meanwhile, make the lemon curd: Whisk together eggs, egg yolks, sugar, and cornstarch in a medium saucepan. Whisk in lemon zest and juice. Cook over medium-low heat, stirring constantly, until thick enough to coat the back of a wooden spoon, about 7 minutes. It will froth up and lighten in color considerably. Remove from heat and whisk in butter, 1 piece at a time. Pour filling into cooled tart shell. Bake until filling is browned, slightly puffed, and set, about 30 minutes. Let cool completely. Store in the refrigerator for up to three days. That looks so professional and the photos are great – whats the camera? were u describing a scene from chocolat? love that movie! for me, i would replace france with cinque terre in italy. 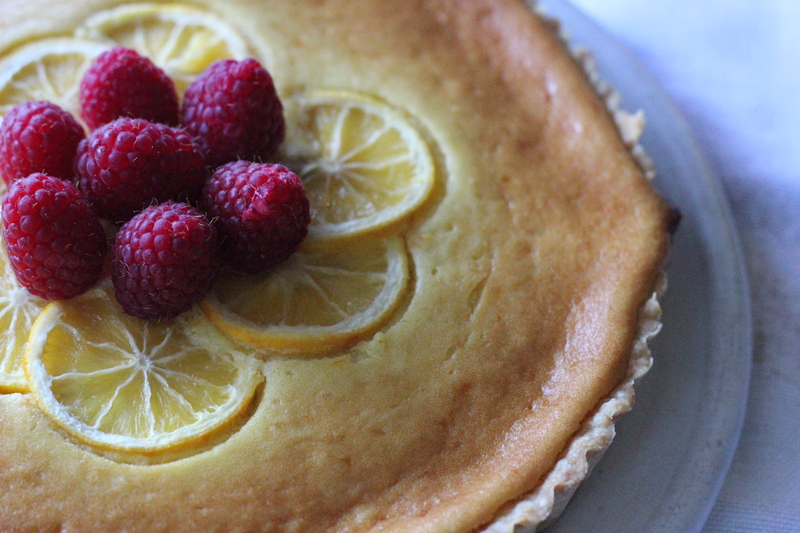 the tart looks yummy! heh, no, although i also love that movie and derive many fantasies from it. i love cinque terre too….in fact possibly that’s more appropriate since the mountainsides are full of lemon trees! thanks for reading, your blog is great!! i never knew that about the crust!! all i know is it comes out tasty when i use the greens recipe. the martha recipe is, like, DECADENTLY buttery, but so delicious. crisp and rich and sweet. she uses more butter and more sugar….so maybe the ratio is still correct. thanks for reading and thanks for writing your blog, too! 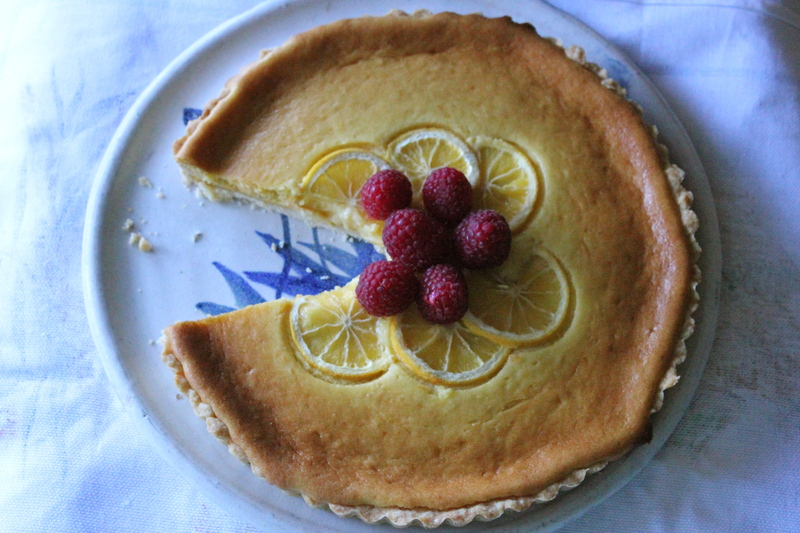 I love this entry, partly because it took me back to when I first discovered Meyer lemons (a pound cake, heaven), and also to when I bought the plate you put that gorgeous tart on! Ann Arbor Winter Farmer’s Market, shopping with JoAnn Petershagen (now Munce), trying to buy something that would simultaneously signal “adult” and “good taste”. I was maybe 23. Obviously I hit the jackpot – that plate shows up on this terrific blog written by my wonderful daughter! Ca-Ching! My name is Connie Stewart. I came across this post while looking for an of middle school friend joanne petershagen. Joanne and I went to scarlett Jr high in 1968-69, the first year it was open. Several in our group ( doris and Charlotte and I are looking for her. Our 40th AA school reunion is coming up in Sept 21. We would like to find out if she is coming, would Like to meet, etc. Could you pass this on and have her contact me . My email is cjstewart57@gmail.com.